Time for the final part of my Bertie 2 project. 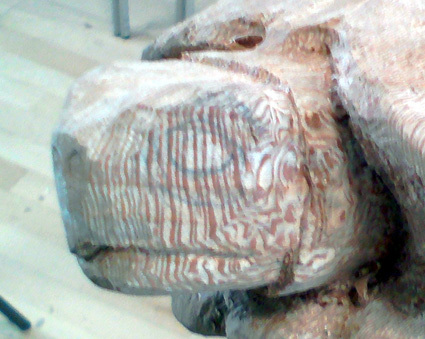 The interesting thing about carving a subject is just how much you study it first. 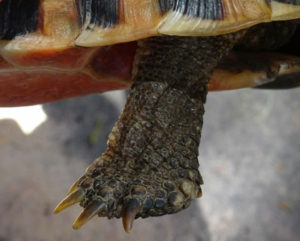 Having had a tortoise in the family for 50 plus years and having him (or her, we still don’t really know) throughout my childhood, only now have I studied the differences between Bertie’s front and rear legs. As you can see from the pictures below, his rear legs are elephant like stumps, whereas his front legs are more flipper like. 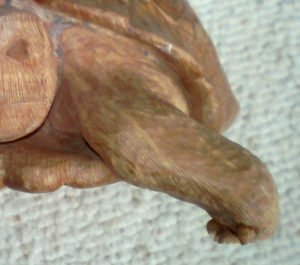 The complication for his front legs is that, as a tortoise walks, the flippers bend inwards so his toes point towards each other, easier to see than explain, but it does make carving them quite challenging to get the movement and curves realistic. Let’s start with the real life versions. Then as translated into the carved versions for Bertie 2. Next will come the final version revealed. 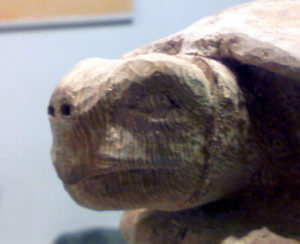 Part 3 of my project to make my own wooden tortoise was to carve Bertie’s head and face. If it isn’t obvious, this is the real Bertie, my model. 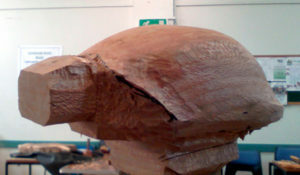 The stages in carving wooden Bertie’s head are shown below. 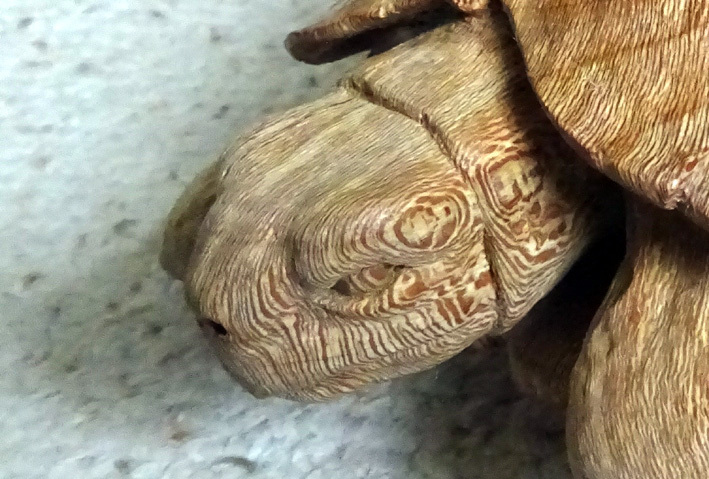 I was careful to select the angle of grain to give me the best chance of getting the lace grain across his head and shell. To say it worked a treat is an understatement. 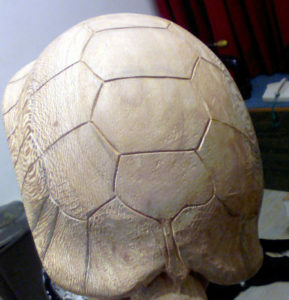 As you can see, the grain flowed down his head to help create the scaly look of his skin. The second picture shows the outline head shape, with the eye marked on in pencil to make sure that I left enough wood to create the eyeball and lids. In the third picture you can see the nostrils and form around the eyes roughed out. I have also left a roll of skin on his neck to give him room to extend his neck. Next time I will move on to his legs and claws. It’s time for stage 2 of the project to carve my own Bertie. This comes with the news that the real Bertie has just woken up and lives for another year. 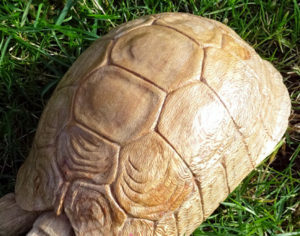 Having completed the outline shape of his shell, which revealed the beautiful lace grain of the London Plane wood, the next part of the project was to carve the ‘scales’ in the shell. Normally this would be a freehand process allowing artistic interpretation. 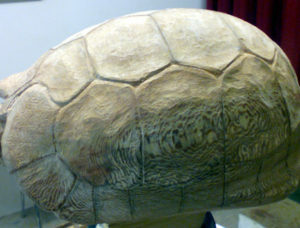 However, what I am doing is copying a real tortoise, so I had to start by studying all the photographs and copying out all the small nicks and curves from ‘real Bertie’ onto ‘wooden Bertie’. 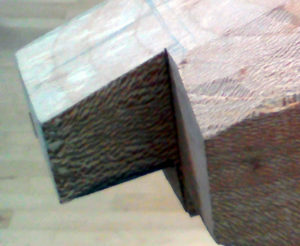 This was then carved out using a simple ‘v’ chisel. As you can see from the first picture, whilst this gives the design, it is hardly realistic. The second picture is about 20 hours work later, where I have added depth to the scales both on their edges and through the undulations over their surfaces. 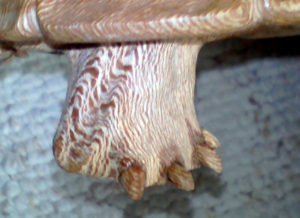 The final picture has the additional texture from the layering in the scales. All in all about 30 hours work and that doesn’t include the underside. Come back soon for part 3, for Bertie’s head and face. 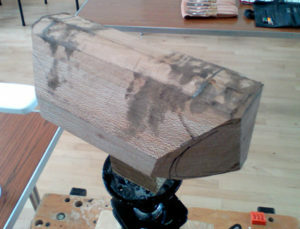 My latest woodworking project has been the creation of Bertie 2. I need to explain. Bertie is ‘my’ first pet. 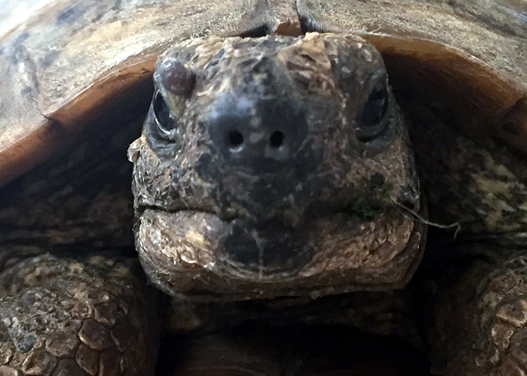 Not many people of 50 something can say that their childhood pet is still alive, but mine is. 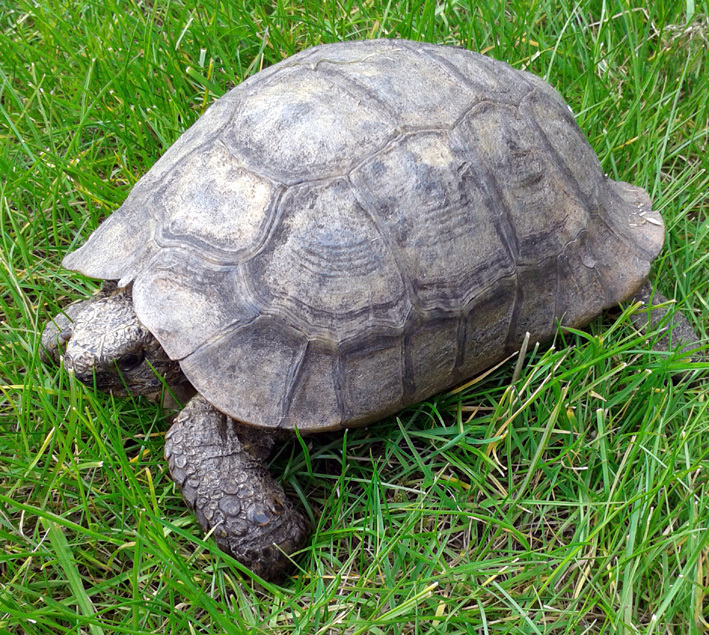 Bertie was/is the family tortoise. He is at least 60 years old. He now lives with my sister. As we don’t have the real Bertie, I decided that I would make my own wooden version. As usual I will go through some of the stages in order to get to the finished piece. Above is the real Bertie. 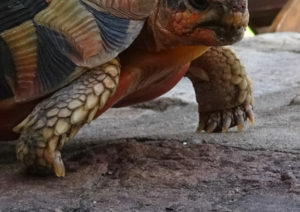 He is about 20cm long, so a small tortoise. My Bertie began with the choice of wood. 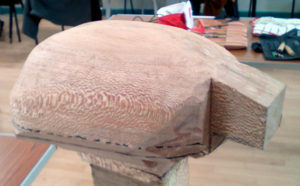 I decided to use London Plane, otherwise known as Lace wood. It has a lovely grain. I cut it across the heart wood so that the lace look would come out across the shell. Part 1 was the taking of a number pf pictures by my nephew, with Bertie placed on graph paper so that I could take key measurements. Stage 1 of the carving process is below. 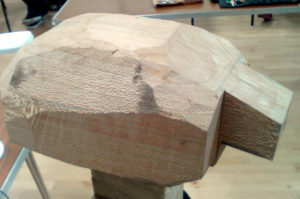 Having selected the orientation to bring out the grain, I gradually formed the outline shape using my new home made carving stand based on a towing ball. 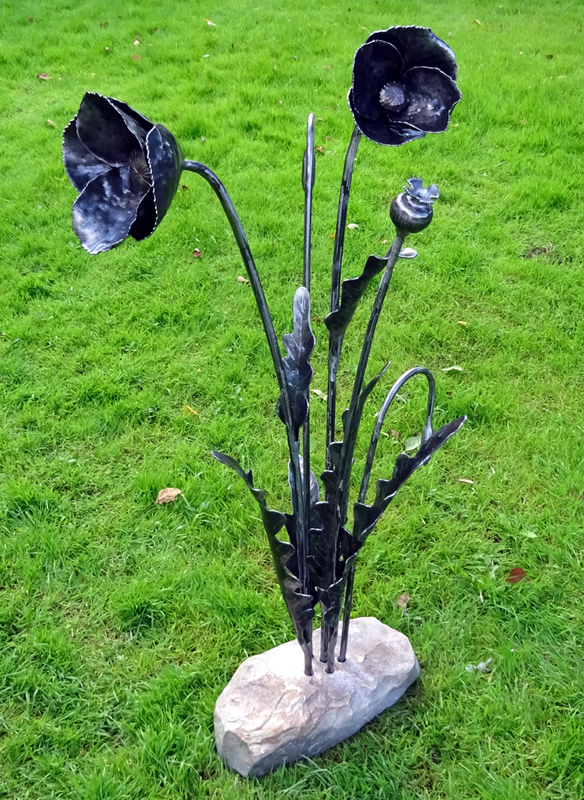 The final stage of the poppy is of course the instantly recognisable seed head. I made 2 for the sculpture. I don’t have any pictures part way through, but they are made from 2 inch tube. This is pinched top and bottom to create the stem and neck. 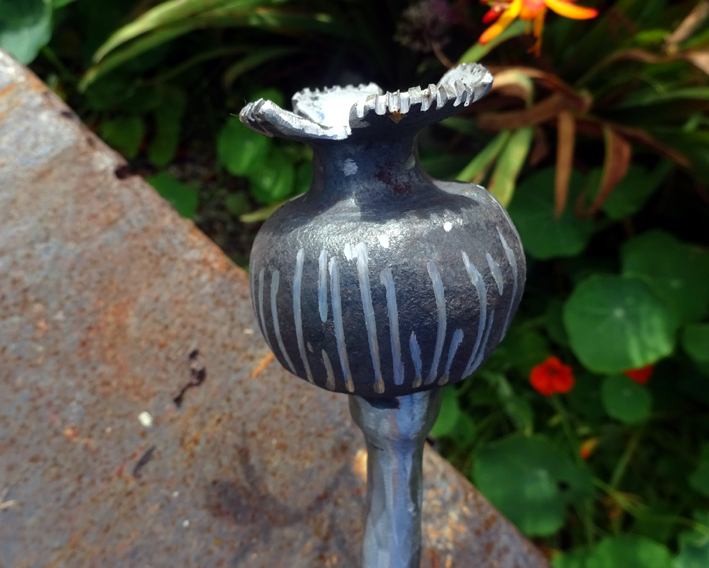 The top is then flared out and shaped to create the feathered edge and the base pinched in to blend in with the stem. 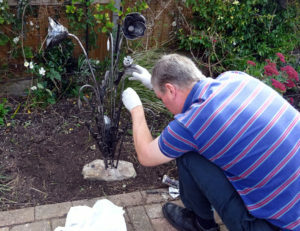 There was then a rather long process of setting up the sculpture ready for my mum’s 80th birthday party. There were many elements to arrange, with viewing points from the garden and the house windows. They then all needed setting into the stone. An hour or so later and all was finished.